The anniversary of the opening of ICBC "Khorgos"
This year we celebrate exactly four years since opening the International Centre of Boundary Cooperation "Khorgos". 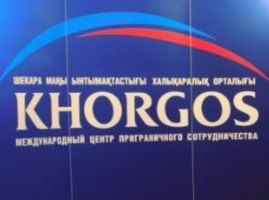 December 9, 2011, during a teleconference with the participation of President Nursultan Nazarbayev, there was opened the International Center of Boundary Cooperation "Khorgos" and docked the railroad "Zhetygen - Khorgos". Since that time, large numbers of people from China and Kazakhstan visited the ICBC "Khorgos". For example, in 2014 the territory of ICBC have been visited by more than 1.6 million Chinese, and for the first 10 months of 2015, more than 3.3 million people went through the border check point of Khorgos. More than 3,000 boutiques operate in Khorgos and the total number of visitors approaching 4 million per year. Also, construction of the new shopping mall "Central Square" started on the Kazakh side of ICBC. A unique project ICBC "Khorgos" continues to increase its importance in the framework of the programms "One Belt - One Road", in particular in the context of the Chinese project "Silk Road Economic Belt" and as an integral part of the Kazakhstan State program of infrastructure development "Nurly Zhol".